CyberLink has been regularly updating their multimedia playback software / PC DVD & Blu-ray players. While ArcSoft dropped out of the software Blu-ray player market a few years back, the only other legal (i.e, one that includes licenses for all required codecs) player - Corel's WinDVD Pro, receives fairly spaced out upgrades. As the HTPC market shifts from a local media-heavy scenario to one where OTT (over-the-top) content like YouTube and Netflix form the main part of the experience, it has become important for commercial software media players to evolve. CyberLink realized this early, with a mobile-centric experience getting introduced in PowerDVD 12. With PowerDVD 14, the technology updates (such as inclusion of HEVC support) were accompanied by a shift in the marketing message from a 'software Blu-ray and DVD player' to a 'media player for power users'. 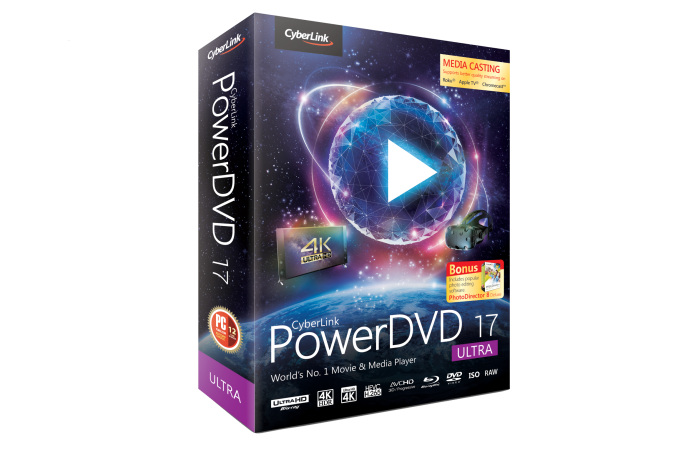 CyberLink is launching PowerDVD 17 today. Similar to the focus on mobile devices in PowerDVD 12, the time is ripe for them to focus on the next big content consumption device - the virtual reality head-mounted displays (HMDs). 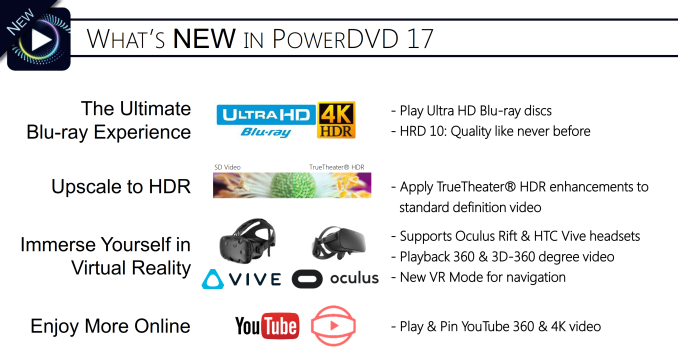 PowerDVD 17 Ultra has a special VR mode that works with the HTC Vive as well as the Oculus Rift for an immersive media experience. PowerDVD 17 is also the fist certified software Blu-ray player capable of playing back Ultra HD (4K) Blu-rays on a PC. The hardware requirements are quite stringent, though. In addition to the two GIGABYTE boards mentioned below, the ASRock Fatal1ty Z270 Gaming-ITX/ac is also an option for a UHD Blu-ray playback-capable HTPC. Pioneer is currently the only choice for PC-compatible UHD Blu-ray optical drives. Coming back to the new features in PowerDVD 17, UHD Blu-ray playback support includes HDR10 capabilities also. The player can also upconvert SDR content to HDR using some proprietary algorithms as part of the TrueTheater feature set. As mentioned earlier, HMD support is available for playback of 360 videos. The UI and navigation is also optimized for HMDs in the VR mode. There is also some additional support for YouTube playback, particularly with respect to 360 and 4K videos. The introduction of VR HMD support enables CyberLink to be an end-to-end media player irrespective of the device used for consuming the content. 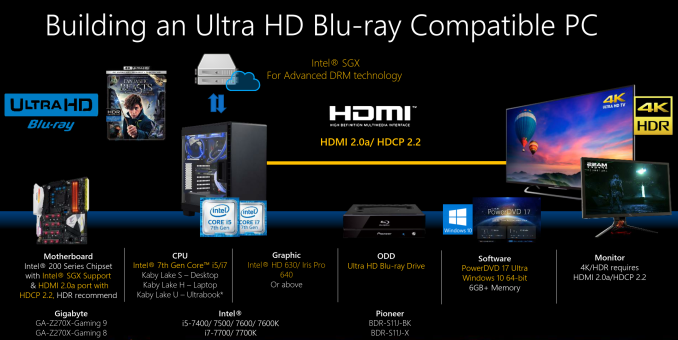 It is no secret that the onerous DRM requirements have made Blu-rays a pain for HTPC enthusiasts. PowerDVD 17 requires an active Internet connection for the first time playback of an Ultra HD Blu-ray movie. Consumers who appreciate the extra video and audio quality from local discs have to put up with these annoyances. In addition to UHD Blu-ray playback, some of the other features such as the TrueTheater effects are not yet matched in a user-friendly manner by excellent open source media players like Kodi. That said, many users appreciate Kodi's open source background, its flexibility, and, obviously the fact that it is free. That brings us to the final aspect - pricing. 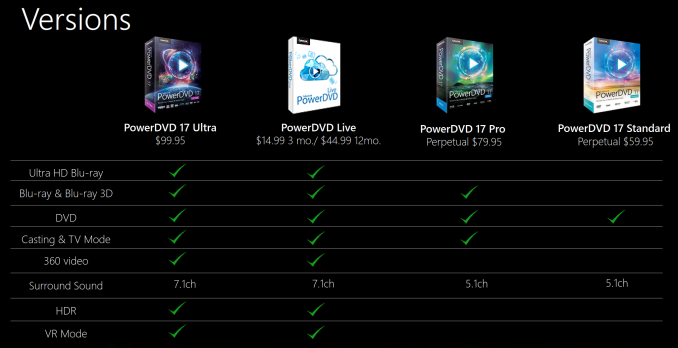 PowerDVD 17 is available in four flavors ranging in price from $60 to $100. CyberLink also has a subscription-based offering - PowerDVD Live. It has the same feature set as that of PowerDVD Ultra, but, is priced at $15 / $45 on a quarterly / annual basis. The gallery below also includes a detailed comparison of the features available in each version.